REINER mobile marking systems for print on glassPrint on glass, quickly, easily and flexibly with our hand printers and the quick drying ink! Whether expiry date, serial number, manufacturer information or product information – whether required by law or simply desired by you, printing on glasses always presents manufacturers with enormous challenges. Until now, stick-on labels were the easiest way to mark jam jars, honey jars, mustard jars, herb jars, spice mills, beverage bottles, vinegar bottles or oil bottles. But labels have many disadvantages. They are not particularly environmentally friendly and they loosen or become illegible especially in humid environments. The design and printing of the labels is also very complex and can deteriorate the product image. But it can also be simpler, faster and less complicated! We at REINER will show you some examples of how you can save time and print directly on glass surfaces, metal surfaces, PET bottles or other surfaces that are otherwise difficult to print on. 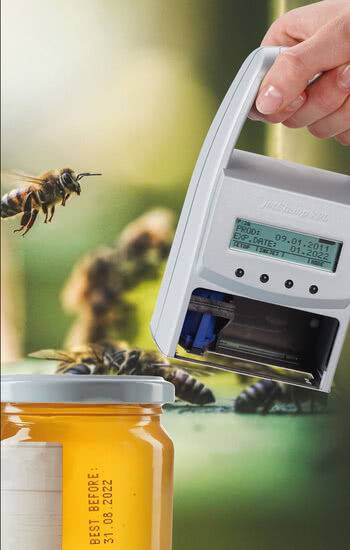 How can honey jars be printed with individual information? How can jam jars, mustard jars or spice grinders be printed? How can windows or acrylic glass be marked? Can cosmetic products also be printed? Can Petri dishes also be printed in laboratories? Can medical products also be printed? What distinguishes the special quality of REINER jetStamp handheld marking devices? Especially beekeepers have to mark their honey jars again and again with individual data, e.g. the expiry date or bottling date. With prefabricated labels this is no longer possible or only with difficulty. Until now, the beekeeper always had to add the expiry date or batch number manually. With several glasses this becomes complex, cumbersome and possibly nerve-racking, since the marking obligation initially has to do nothing with the actual beekeeper handicraft. Use the REINER handheld marking device jetStamp 790 MP or the handheld marking device jetStamp 792 MP instead. Simply prepare the text with a few mouse clicks using the supplied software. 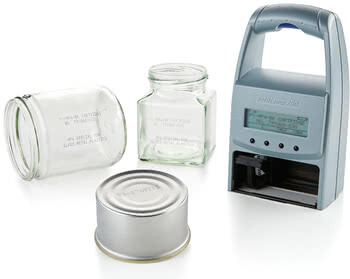 After filling the jars with honey, you can quickly and easily print the jars with the battery-operated handheld marking device (jetStamp 790 MP) and the quick drying special ink from REINER and put them on sale immediately. If you repack several honey jars in one carton or in foil, you can also print the carton or foil with the device. The large manufacturers can fill the glasses on the assembly line and then automatically label and print them. For smaller quantities and especially for individual, small and self-producing spice shops this is no alternative. Not everyone has the space and budget for the large industrial printers or the corresponding industrial marking machines. 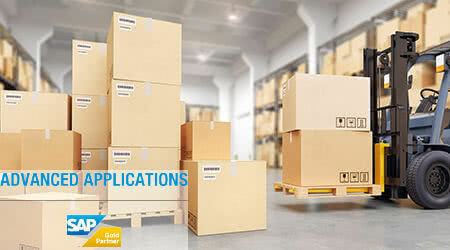 REINER offers the perfect marking solution! Especially for small or medium batches we have created the suitable solution with our handheld marking devices. Space-saving and equipped with a high-quality battery, you can print on glasses, spice grinders and other surfaces quickly and easily. You don't have to prepare much for that. Marking the glasses can be done quickly and quietly in addition to the actual sales business. Position the handheld printer over the glass and print the previously saved text directly onto the glass surface. Unevenness is no problem. The printout adheres immediately thanks to the quick drying ink. With the handheld inkjet-printer jetStamp 790 MP or the mobile inkjet-printer jetStamp 792 MP you can print every single glass and every glass grinder individually. you must specify the shelf life expiration date or the alcohol content, among other things. Labels often ruin the beautiful bottle design. 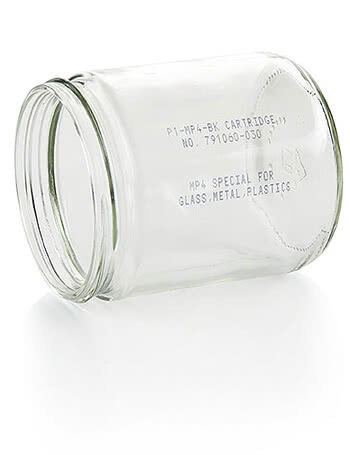 Simply do without the annoying labels and simply print the glasses directly. Incidentally, the REINER solution can also be used to print directly on smaller vessels, such as a test tube or a small metal can. The quiet and fast printing ensures that your customers are not disturbed when shopping for pleasure! Due to the easy handling of the mobile inkjet printers, these activities can also be carried out by assistants. Whether window panes or acrylic glass panes, both products are usually characterised by a smooth surface. Some window panes or acrylic glass products also have special notches and patterns that make gluing almost impossible. If serial numbers are required here that make the delivery process traceable, labels are often the worse solution. It is easier and better to apply the product markings directly via a REINER battery-powered manual printer. The panes can then be assigned to customers and rooms on site and simplify installation. With special cleaning agents, the printed data can be removed without residue after installation, so that no disturbing elements are visible. The identification printers jetStamp 790MP and jetStamp 792MP are also suitable for this application. Save the prepared print samples on the device and mark the window panes or acrylic glass panes directly. By the way, you can also use the same device to mark or mark the outer packaging carton, the outer packaging film or the pallet. Yes, REINER has the right solution for you. 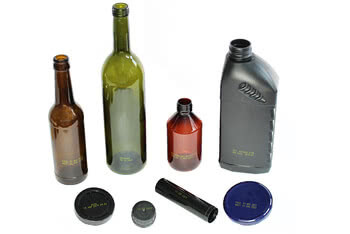 Cosmetic products such as creams, perfumes, shampoos and massage oils are usually filled into glass bottles, flacons, PET bottles or cans due to their special product properties. As with foodstuffs, cosmetic products must be labelled with the best before date (SLED). For smaller or even medium quantities, printing with the mobile inkjet-printer jetStamp 790MP or the mobile inkjet printer jetStamp 792MP is worthwhile. Even before filling, the printing can be prepared for PC with the help of the supplied software and transferred to the handheld marking device. Shortly after or even during product filling, the packaging can be printed with the corresponding data. An individual label is no longer necessary and nothing stands in the way of your presentation of the individually printed products. 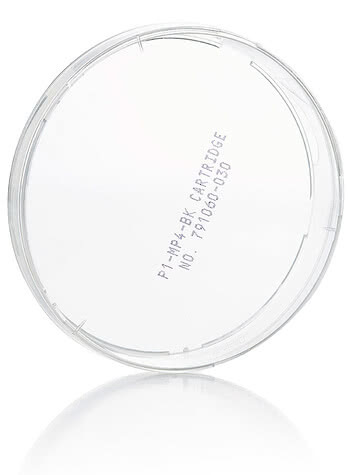 Petri dishes and test tubes can be printed quickly and easily with the handheld inkjet-printer jetStamp 790MP or the mobile inkjet-printer jetStamp 792MP. Direct printing with REINER handheld marking devices eliminates the need for adhesive labels. This makes it much easier to comply with the strict standards in the laboratory. Several different data, serial numbers or times, such as 2018-07-25 4:33 p.m. can be printed on Petri dishes via the built-in memory. Due to the robust design, disinfectants cannot affect the housing of the REINER jetStamp units. 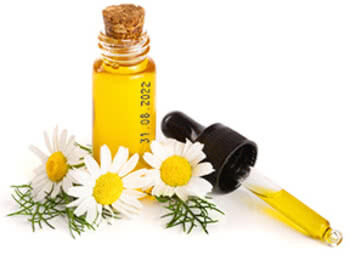 One of the main tasks of pharmacies is to individually compose and mix medicines for your customers. Whether ointments, tablets or tinctures, all these medical products may have a very short shelf life. Print the expiry date and the composition or the serial number directly on the packaging with the REINER hand-held printing devices. Due to the flexible and handy application, this can be done directly after the mixing process and filling. This procedure considerably reduces the risk of confusion later on. The software specially developed by REINER is easy to understand and the electronic stamp can also be used quickly without much instruction. This means that pharmacists can once again devote more time to their essential tasks. Another advantage of the devices is the quiet and fast printing. This does not disturb colleagues or customers. Due to the robust surface, the handheld marking device can also be easily cleaned and disinfected. The REINER jetStamp models are very robustly built and are therefore also suitable for demanding environments. The nozzles of the cartridge are specially protected, which prevents the ink from drying out in the device when not in use. Our handheld marking devices are handy, very user-friendly and have been specially tested. This avoids long learning times. 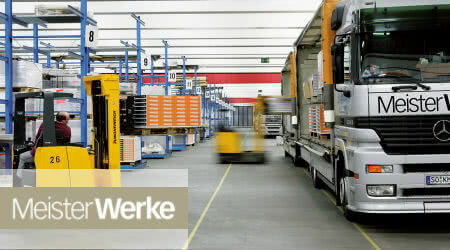 The included software developed for REINER products is easy to use and quick to learn. A large number of stamp impressions are already pre-defined for each device, so that you can get started without much configuration effort. 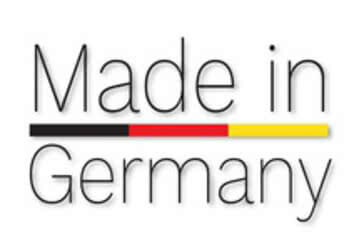 The design and construction "Made in Germany" stands for highest quality, reliability in daily use and a long service life.